How can I get my puppy to stop peeing in her crate? Before we brought home our first puppy we read several books about how to train puppies. One of our favorite books that we suggest for any new puppy parent read is Puppies for Dummies. In fact, Puppies for Dummies was the first book I read before bringing Linus home from the Carson Animal Shelter. We wanted to learn as much as we could about puppies before diving into puppy ownership. Now 10+ years later we continue to read books about puppies and dog training. It might be a good time to put together a list of our favorite puppy training books…stay tuned. We rescued Linus from the shelter, fostered dozens of puppies and dogs, raised 11 guide and service dog puppies, and puppy sat countless dogs and puppies. Maybe we’re not experts, but we do think we know a little more than the average bear. Over the years we’ve kept the answers in the comment section, but starting this year we’re going to highlight questions and answer it right here on the blog! Our hope is to build a resource section and help answer some of the most common puppy training questions. We hear this question several times a month in it’s different variations. You have to remember that a puppy as young as yours (around 9 weeks of age) probably does not yet have full control of her bladder. She may not always know when she has to potty, but there are some things you can do in your situation. Your goal is to not allow your puppy to potty in the crate anymore. At some point in time she learned that it was okay to potty in the crate. If she’s having accidents in the crate during the day and at night you need to make sure you reduce the amount of time she spends in the crate and over time incrementally extend the amount of time she spends in her crate. Crate size is too big. If you’re crate is too big then your puppy will often times use one side to potty (her bathroom) and the other side to sleep (her bedroom). A crate should only be large enough for your puppy to stand up and turn around any bigger than that and you might have a few potty accidents. If you’re looking for a crate we recommend the MidWest Life Stages Double Door Crate which has a divider allowing you to adjust the size of your crate as your puppy grows. Before you brought home your puppy she learned to potty in her crate. In general puppies will not potty where they sleep, but there could be reasons why your puppy learned to do this before you brought her home. If you bought from a pet store (please don’t buy from pet stores as the majority of these puppies come from puppy mills) your puppy probably learned to potty where she sleeps. The same could be true if you purchased from an irresponsible breeder. Responsible breeders will often times start potty training their pups before they go home with their new families. 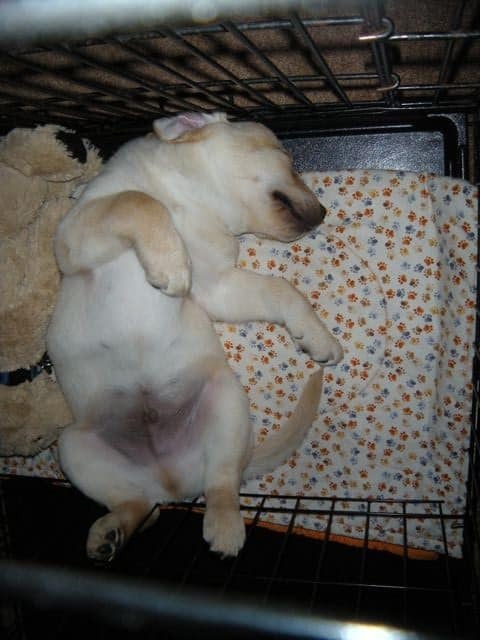 If you adopted, your puppy may have learned to potty in there kennel or other sleeping area. You never really know, but sometime in her past she may have learned to potty in her crate. She has a bladder infection or some kind of health issue. A trip to the veterinarian may be in order. You might want to consider this as an option if your puppy is having unusual potty accidents. Since your puppy is peeing/pooping in the crate overnight without any whining to alert you then you should consider setting your alarm clock 2-3 times spread out through the night, wake up, take your puppy to her potty spot, have her potty, then take her right back to bed. Another thing you should do to help avoid future puppy potty accidents in crate is thoroughly clean your crate using an enzymatic cleaner like Rocco & Roxie Stain and Odor Eliminator. Your puppy’s nose is thousands of times more powerful then yours if she can smell the urine in the crate then she might go there again. Moving forward, anytime she has an accident make sure you thoroughly clean the crate again. If you’re putting blankets or towels in the crate I would consider removing these. Puppies usually like going potty on soft surfaces as opposed to hard surfaces. As mentioned earlier make sure you have the right size crate. If you bought a large crate to allow your puppy to grow into it I would either purchase a smaller, proper sized crate or use a divider to make the crate the correct size. Consistent Feeding Schedule = Consistent Potty Schedule. You should start keeping a daily puppy potty schedule to keep track of every time your puppy pees, poops, eats, and drinks water. You’ll notice that your puppy is very predictable as to when she potties in relation to the times she eats, drinks, plays, etc. Make sure you feed your puppy at least a couple hours before you put her to bed for the night. Make sure you take your puppy out to potty (and make sure she goes) right before you put her in her crate for the night. By the way, we’ve had puppies potty outside then immediately potty again inside the house. If you are having this problem check out this blog post. It’s always a good idea to speak with your local professionals. If you don’t already have a local veterinarian or dog trainer then you should start doing some research to find some good ones in your area. Having a good vet and trainer will be a great resource for you and your dog today and into the future. You should also consider enrolling in a puppy kindergarten which will give you a chance to socialize your puppy, learn basic obedience, and have a professional dog trainer to ask questions. It always feels better when you realize that you are not the only one experiencing these puppy training and behavior problems. QUICK RECOMMENDATION: Real world training like puppy kindergarten is invaluable, but if you’re looking for some solid puppy training foundations then check out Puppies for Dummies (I know we mentioned it earlier, but it’s worth repeating). It’s a good book for learning the basics of raising and training a puppy. What about everyone else out there? Have you had any problems with crate training your puppy? Did your puppy used to potty in her crate? If so, tell us what you did to solve the problem. Don’t overuse your crate. – we are advised to not crate our puppies for more than 3 hours during the day. Overusing your crate can result in your puppy having a pee pee accident in the crate. Keep your crate clean – Make sure you thoroughly clean all pee and poop accidents. We recommend Rocco & Roxie for removing stain and urine odors. Keep a schedule – Keep a consistent feeding schedule and you’ll notice a consistent potty schedule. Make sure you write it down! That’s it folks! Good luck with your puppy training. Let me know if you have any questions. Take her water away 2 hours pior to bed time. If she goes in the crate at 10pm, remove the water at 8pm. Then right before putting her in the crate, walk her so she can eliminate. When you wake up, quickly remove her from the crate and walk her. Sometimes dogs will eliminate bc we don’t take them out fast enough. I just rescued a chiweeni.not sure of her age,she was rescued by someone else from a drug house,but she around 9 to 11 weeks old.i have had other puppiws before and I’m usually pretty good at house training and kennel training.she has the kennel training down until the morning.she screams like a banshee when she hears us moving around,but I like to keep her on a schedule of being out of the kennel at 8:20 am every morning.during the day I put her in the kennel just to keep her used to it and she has no accidents.at nigjt she goes pee and poop in their,without a sound and does not care about laying in it.im having to bathe her everyday.and I have a small kennel with the divider in place,does not help.shes a white dog,until morning,then shes yellow and stinks.i had a chichi before and never had this much trouble.but this is the first time ive had a dog from a bad situation like a drug house.plwase help. I have a one year old Wheaton terrier and every time we leave the house he pees in the cage no matter if we take him out right before he goes in the cage. If I’m gone one hour or four hours, he pees. He is never in there more than four hours a day. What do I do? Our puppy is doing the same thing – she goes overnight with no problems but as soon as we leave the house for work in the morning, right after she’s been outside to potty, she pees in her kennel. Would love to hear suggestions, as it sounds like separation anxiety more than bladder issues. I am having the same issue with my puppy and she is 14 weeks. Did your puppy ever stop, have you found solutions? Hello!! I have a 7 year old dog that we adopted (he was house trained) and we have had him since March, then we moved across country in June. He kept his house trained mode when we brought him home but since we have moved he has been peeing and pooping in the house. (We showed him where to go potty when we moved there and how to use the new dog door.) So now we leave him in his crate and he is peeing in his crate when we are gone. We took him potty before we left and then came home to a mess so we crate him. We take him potty before we leave and put him in his crate. We are gone for an hour or less and come home and he has peed in his kennel. He knows how to get outside to go potty because he does it when we are home, but when we are gone is when he goes in the house. When we leave he comes out of the dog door too, so I know for sure that he knows how to use it. He gets to go through the garage to get outside and before we crated him we have come home to pee and poop in the garage, feet away from his dog door that leads outside.What do I do? My 15 week old male, wheaten/poodle mix is able to sleep through the night and keep his crate clean. However, he cannot keep it clean while we are out at work, for the same amount of hours during the day. He also has random accidents inside at other times. We have shortened the crate and taken out soft padding. He definitely knows that outside is where he gets rewarded for making. Please help! My 9 week olds pee in the crate intentionally. They literally stand up on their hind legs and pee all over everything almost as if they are marking their territory. They know they get rewarded for going outside and we don’t let them ever go more than 3 hours unless they are asleep. They go out the minute they wake up or bark but sometimes they just stop playing to stand up and pee without warning.